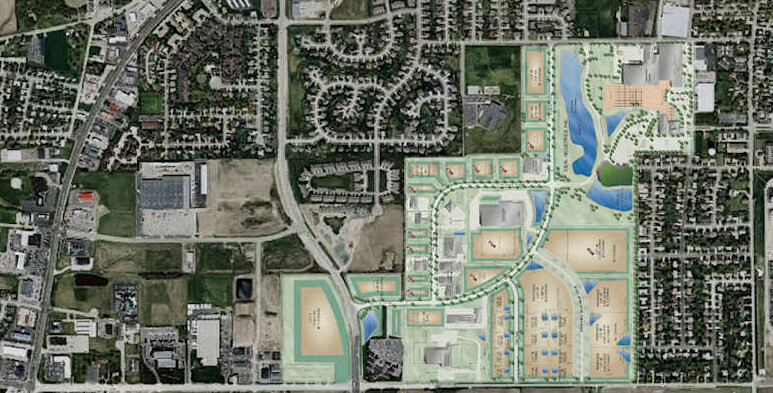 Sycamore Prairie Business Park’s strategic location captures the growth pattern of Chicago’s desirable western suburbs and the Interstate 88 Illinois Research and Development Corridor. The park offers congestion-free access to local and distant points. To see more detailed maps of the area we have also provided them in Adobe® PDF format. You will need Adobe Acrobat Reader® to view or print them. You can download a free copy of this program from Adobe Systems’® web site. Detailed Map click here. Peace Road provides 5 minute direct access south from the site to an interchange for the I-88 Tollway. An additional I-88 interchange at Annie Glidden Road is located 10 minutes southwest via several major roadways. Interchanges for the I-90 Tollway at Route 47 and Genoa Road are 30 minutes northeast and northwest respectively. Interstate 39, providing north-south expressway travel through Illinois, is located 15 minutes west of the site via Route 64 or Route 38. In addition to Peace Road the project is convenient to major roadways including Route 23, Route 38, Route 64, and Route 72. A number of air travel options exist for park tenants; O’Hare International Airport is located 55 miles east, Midway Airport is 65 miles southeast and the Greater Rockford Airport is 25 miles northwest. DeKalb Taylor Municipal Airport, located 3 minutes south of the site, and Du Page County Airport and Aurora Municipal Airport located 30 minutes east can accommodate corporate jets.